Join Faith Ringgold and her daughter Michele Wallace in conversation as they discuss the timeframe captured in the exhibition WE WANTED A REVOLUTION—BLACK RADICAL WOMEN, 1965–1985, which closes this weekend at CAAM. This event will be moderated by Erin Christovale, assistant curator at the Hammer Museum. FAITH RINGGOLD IN CONVERSATION, Saturday, January 14, at 1:30 pm. 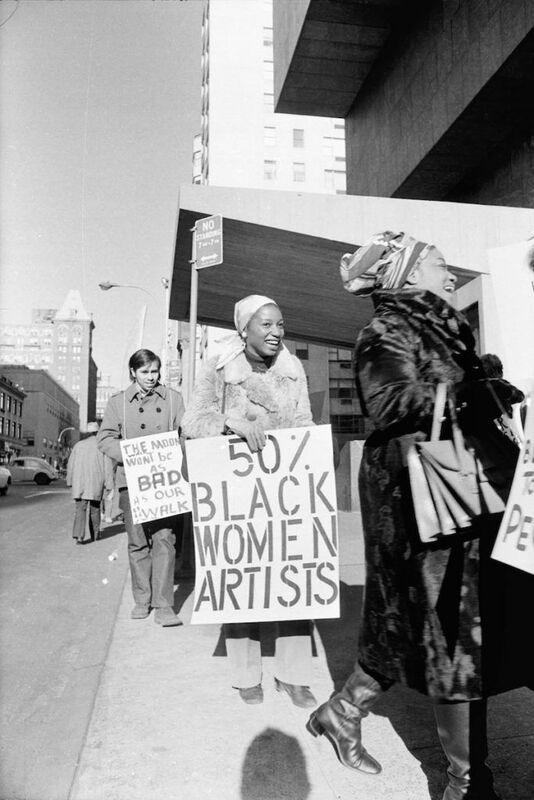 Jan van Raay, Faith Ringgold (right) and Michele Wallace (middle) at Art Workers Coalition Protest, Whitney Museum, 1971. This entry was posted in ART, CONVERSATION, EDUCATION/ACTIVISM and tagged California African American Museum CAAM, Erin Christovale, Faith Ringgold, Hammer Museum, Jan van Raay, Michele Wallace, We Wanted a Revolution—Black Radical Women 1965–1985 CAAM on January 12th, 2018 by Barlo Perry.